The Parliament of the United Kingdom has reached an opposition majority to seek a parliamentary consensus on a Brexit option, however, British Prime Minister Theresa May has warned she does not promise her government would abide by the majority decision of the members of parliament. 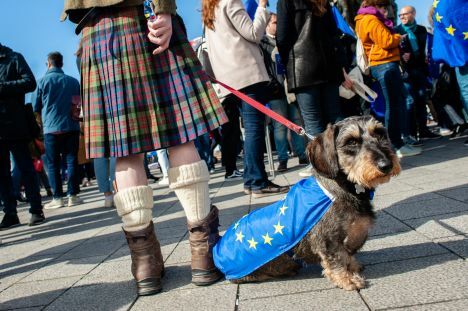 British public broadcaster BBC reports that in the votes on Monday, March 25, the government was defeated by 329 votes to 302 on the cross-party amendment setting up a series of votes on Wednesday to find out what kind of Brexit has most support among MPs. Thirty Conservative MPs voted against the government, including three ministers. Richard Harrington, Alistair Burt and Steve Brine resigned to join the party’s inner opposition, with Harrington accusing the government of «playing roulette with the lives and livelihoods» of Britons. Labour Party leader Jeremy Corbyn stated MPs would want to find a consensus on the way forward, including a possible «confirmatory vote» on the PM’s deal by the public. PM May has said earlier that she did not want this option because Remain would be on the ballot paper.